James R. Hallford Stadium in Clarkston plays host to a key Region 5-5A matchup as the Arabia Mountain Rams entertain the No. 9 ranked Southwest DeKalb Panthers in a battle of undefeated region teams on Friday at 7:30 pm. Arabia Mountain (5-3, 3-0) has won three second of the four previous meetings between the DeKalb Schools including 14-7 (2016) and 27-14 (2017) on the way to back-to-back Region 5-5A titles. The Rams have locked up a playoff spot for the third consecutive season under Coach Stanley Pritchett (38-24, 6th season) and it is their third overall in 10 seasons of football. The Rams offense is led by senior quarterback Bryson Williams (76-132, 1084 yards, 10 TDs). Junior Jordan Barrow has 17 receptions and four touchdown catches on the season to lead the receiving corps. The rushing attack is led by junior Jaylen Burke who has 454 yards rushing and four touchdowns on 90 carries on the season. Senior linebacker Derico Smith has 72 tackles (7 for loss, 4 sacks), three fumbles caused and two fumble recoveries to lead a stingy Southwest DeKalb defense allowing just 128 yards of total offense per game and 5.5 points per game. The Panther defense has four shutouts on the season and has allowed over 10 points just twice to Class 6A teams Stephenson (14) and Lovejoy (16). Joshua Tate has just 47 tackles but 17 are sacks as the senior linebacker teams with Smith. The defense has 30 fumble recoveries and seven interceptions on the season. The Panthers ground game is led by seniors Eian Scott (600 yards rushing, 5 TDs) and Jamel Starks (346 yards rushing, 7 TDs). Sophomore quarterback Rion White has thrown for 777 yards and seven touchdowns on the season. Junior Aquil Muhammad leads the receiving group with 19 receptions and three touchdowns. Junior linebackers Jamie Buckhanan and Chandler Martin lead the Rams defense with a combined 105 tackles and six tackles for a loss. Martin has three interceptions as well. Senior defensive linemen Thomas Rayton and Thomas Douglas have combined for 6.5 sacks and 10 tackles for loss to lead the interior of the Rams’ defense. A Southwest DeKalb victory would sew up the Region 5-5A crown for the Panthers while a Rams win could have several ramifications on the final playoff seeding depending on the outcome of Lithonia’s final two games of the season. In other Region 5-5A action Lithonia (5-3, 2-1) and Miller Grove (2-6, 1-2) collide at Godfrey Stadium on Saturday at 7:30 pm in a game that could decide the No. 3 seed in the region. A Lithonia win keeps the Bulldogs hope of a region title alive while Miller Grove to take the front runner’s spot for the No. 3 seed heading into the final week of play. Tucker and Stephenson are headed to a showdown for the Region 4-6A championship if they can get by their opponents this week. The No. 3 ranked Tucker Tigers (6-2) travel to Clayton County’s Tara Stadium on Thursday (tonight) for a 7:00 pm kickoff against Mt. Zion-Jonesboro (2-7). A victory would put the Tigers in first place at 7-0. Stephenson (7-1, 6-0), the No. 8 ranked squad in Class 6A, plays host to current third place team Lovejoy (5-3, 5-1) on Friday at Avondale at 8:00 pm. 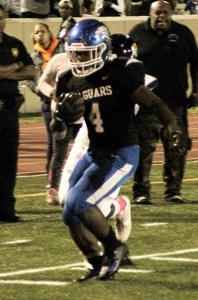 The Jaguars need the win to keep on track for a first round host role in the state playoffs.